LAFUMA Mobilier : discover the subtle alliance Comfort & Style from our Premium PRIVILEGE collection! 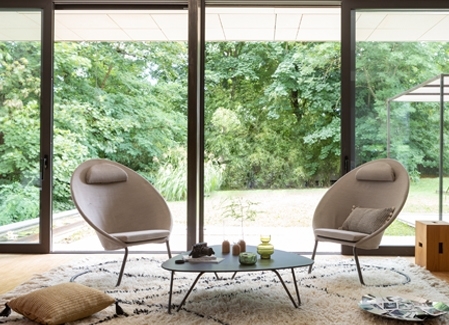 Relaxation and a carefree nature go hand in hand with the Lafuma Mobilier brand. Discover our PRIVILEGE furniture range, designed to be there for your most relaxing moments! Try the combination of French-style elegance with the high quality of a product that is “Made In France” . With a unique design, and clean and light lines, the products in the PRIVILEGE range reflect an aesthetic, free way of living. Our indoor/outdoor technical fabrics, developed by teams of the most demanding stylists and engineers, will offer unrivalled comfort for everyday well-being. The Hedona fabrics combine comfort and strength, thanks to soft padding and a woven two-material canvas. Here we see refinement at mealtimes, next to the pool, on the patio or in the garden, and fits seamlessly in the living room. Also discover the new colour Jade, a sea green, which brings a fresh breeze to this collection. Finally, the new Tundra finish, also designed for a mixed indoor/outdoor use, will appeal to fans of interior design with its soft feel weave and designer accents. This soft, padded fabric offers unbelievable comfort while being resistant to daily wear such as bad weather. So many technical qualities which make this textile the perfect partner for relaxation. Available as garden furniture, sun lounger and also lounge chairs, the PRIVILEGE collection guarantees to bring a style with pure lines and refined textiles to both your indoor and outdoor living spaces, accompanying you in all the happy moments, by yourself, with friends or with family.